Antonio Ocampo walked freely into the jubilant embrace of community members today after 97 days in illegal custody at the hands of Sheriff Marlin Gusman. The federal judge ordered Sheriff Gusman to produce Ocampo in an emergency hearing after Mr. Ocampo filed a writ of habeas corpus late Friday. The judge declared that Sheriff Gusman’s incarceration of Mr. Ocampo on an expired ICE detainer was indeed a violation of his constitutional rights. “When the constitution says ‘we the people’ that includes me,” said Mr. Ocampo shortly after his release. Community members and advocates stared Sheriff Gusman down in a tense face-off that lasted all day. Soon after U.S. Marshall served him an order to appear in court, Sheriff Gusman attempted to turn Mr. Ocampo over to ICE custody. 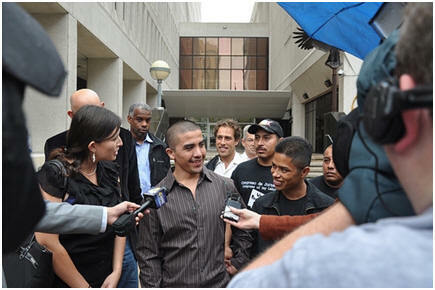 “Sheriff Gusman violated Mr. Ocampo’s constitutional rights and then attempted to deport the evidence,” said Jacinta Gonzalez “We stopped him.” Community protests outside Sheriff Gusman’s office led to a tense meeting in which Sheriff Gusman admitted that his lawyers had called immigration authorities and asked them to arrive at the courthouse. Furious community members demanded that Sheriff Gusman instruct his lawyers to call ICE off. “It is unconscionable that the Sheriff on the day he was to appear in federal court to defend himself against Mr. Ocampo’s allegations would recruit ICE to be his pitbull in an obvious attempt to intimidate Mr. Ocampo. Under threat of further protest and media exposure Sheriff Gusman backed down, disappeared into a back room in his office, and spoke to his lawyers. He immerged minutes later saying ICE would not appear at the courthouse.